Radius Application Panels can be formed for installation on curved substrates. 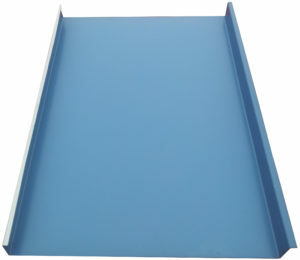 Coverage 10″ – 28” panel coverage, with a 1” seam height. Minimum Slope Recommended slope 2/12 or greater. Substrate Recommended subsrate 1/2″ – 5/8” plywood with a minimum 30 lb. underlayment. Length Panels are continuous lengths from eave to ridge. Fastening System Concealed fastener system. Recommended 2 screws per clip spaced 16” o/c. Vertical Seam 1″ mechanical lock, double or single. Fasteners #10 x 1” flat head screws. Materials Panels are fabricated from 24 gauge mill finish or prepainted Galvalume. Coatings & Finishes 24 gauge Galvalume* panels are available in a variety of colors and coated with a full-strength Kynar 500 finish. Warranty 20, 25, and 35 year manufacturer warranties available. Panels are available in aluminum and 16 oz. copper. All flashings and accessories are fabricated from the same coil stock as the panels. Standing Seam orders are all inclusive: panels, clips, screws, and all flashings are incorporated into one per square price. * Galvalume sheet uses an aluminum (55%) – zinc (45%) alloy coating that offers greater corrosive resistance, higher temperature oxidation resistance, and higher heat reflectivity than standard galvanized steel. † Kynar 500 is a premium fluorocarbon coating, produced with full strength Kynar 500 resin. This affords maximum exterior durability due to its outstanding resistance to ultraviolet radiation. These are the highest quality finishes available.